Recently the Finnish Company Nokia got the whole tech community excited after it was known that the company CEO, Rajeev Suri would be giving an essence at the upcoming MWC. So, today we will discuss about the Nokia D1C and P1 Android smartphone price, release date, features, and specs. Recently we told you that an essential update on the Nokia website brought a section not seen for a long time. The company itself confirmed that its first smartphone running Android will be released in early 2017. The news marks the return of the Finnish company into the smartphone market, after the sale of the mobile devices division to Microsoft, in 2013. As we all know that the smartphones of Nokia will be manufactured by HMD global, a Finnish company that bought the rights to the iconic brand of mobile phones, as explained earlier. Nokia had done something similar in the tablet market with the N1, which looked a lot like the iPad mini and was produced by Foxconn, but the product was restricted to a few markets such as China and Russia. But, the Finnish Company Nokia got the whole tech community excited after it was known that the company CEO, Rajeev Suri would be giving an essence at the upcoming MWC (Mobile World Congress), which is expected to take place early next year. However, now at least we know that Nokia D1C and P1, they both are smartphones. As, previously, we have seen few leaks which suggested that the Nokia D1C might be the upcoming Android powered tablet from Nokia. However, fresh image renders from Weibo shown us fully a different story. So, it is expected that the Finnish company Nokia may launch the Nokia D1C in two variants and Nokia P1 at MWC 2017. A new report claims that the two variants will come with a different display, RAM, and camera specifications. 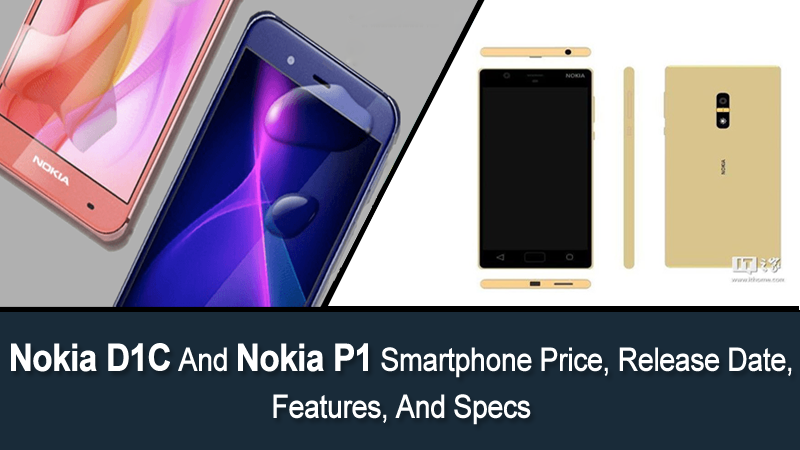 Now the question arise here that “what will be the specifications, price, features and expected release date of upcoming flagship device from Nokia which will be the Nokia P1 and mid-budget smartphone Nokia D1C”? As we told you all that the Finnish company Nokia will not launch two devices, as the Finnish company Nokia has planned to launch three devices. Yes, the flagship device Nokia P1 and the mid-range device Nokia D1C and the third one is still unknown. The Nokia’s flagship Android Smartphone P1 will come in two variants, 5.2-Inch and 5.5-Inch. Both will have a QHD AMOLED display with a resolution of 2560×1440. The Nokia P1 Android smartphone will also have an IP68 water and dust resistance certification. As we earlier told you all that its design might be based on Sharp Aquos P1, but the device will come in fully metal design. Moreover, the Nokia P1 will be powered by Qualcomm’s Snapdragon 821 SoC along with the 3GB of RAM. While it is expected that the device will come with a 3000mAh battery. Nokia D1C will be powered by Qualcomm Snapdragon 430 processor clocked at 1.4GHz coupled with Adreno 505 GPU, and will come in 2GB and 3GB RAM variants. It is said to run on Android 7.0 Nougat and come in 5-inch and 5.5-inch full-HD display options. Both the variants are likely to come with 16GB inbuilt storage. On the camera front, the Nokia D1C variants are said to be available in 13-megapixel and 16-megapixel rear camera modules. While, both the variants are expected to sport 8-megapixel camera at the front”. However, the Finnish company Nokia has already given clear hints of what we can expect next year. Yes, the site itself states that “Nokia is busy working on the smartphones running Android,”.